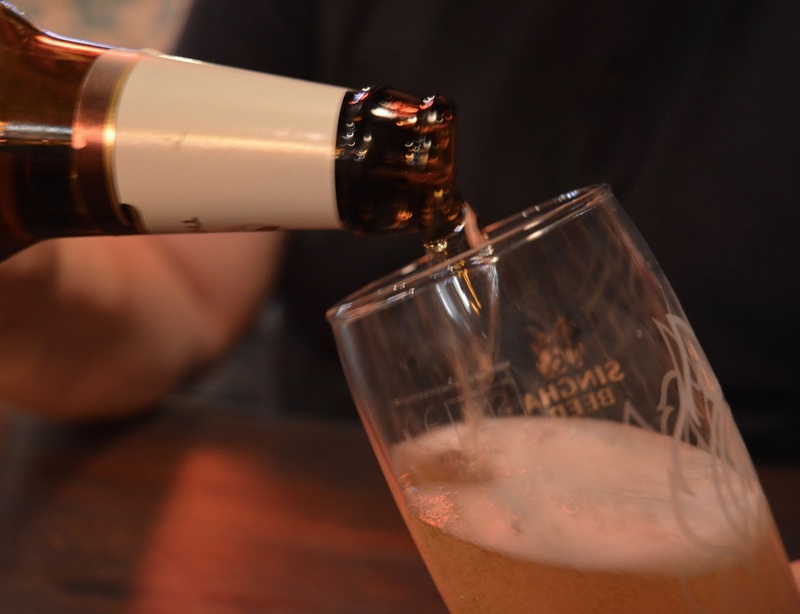 You may remember our EPIC VIP feast at the Metrocentre a few months ago. 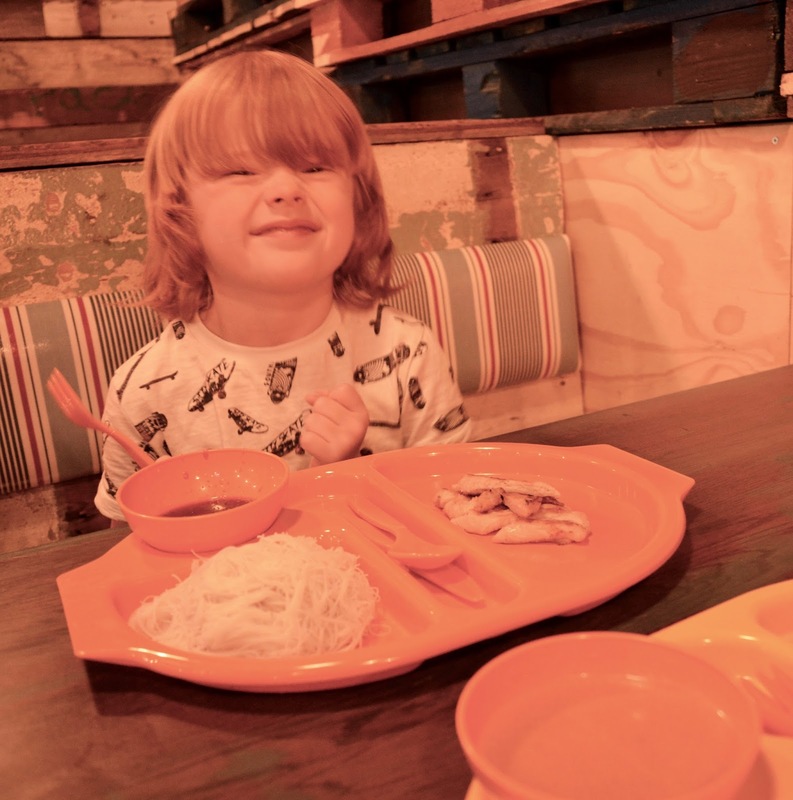 Well Thaikhun is one of the restaurants that really stood out for us so we were delighted to be invited back to try their children's menu properly. 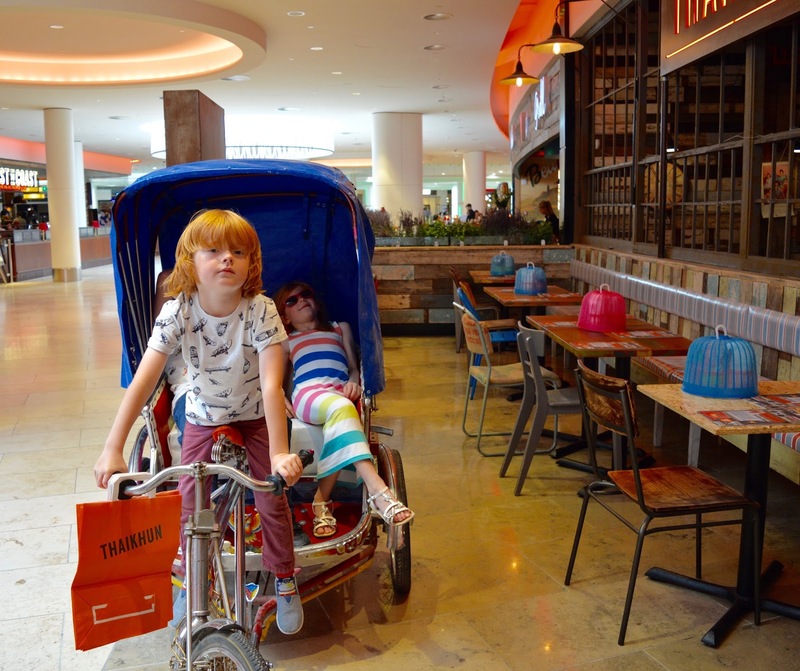 Located in the new Qube in the Metrocentre, the decor is authentic and fun. We settled into a nice booth style seat which I always love as you can block your children in and stop them escaping - haha. 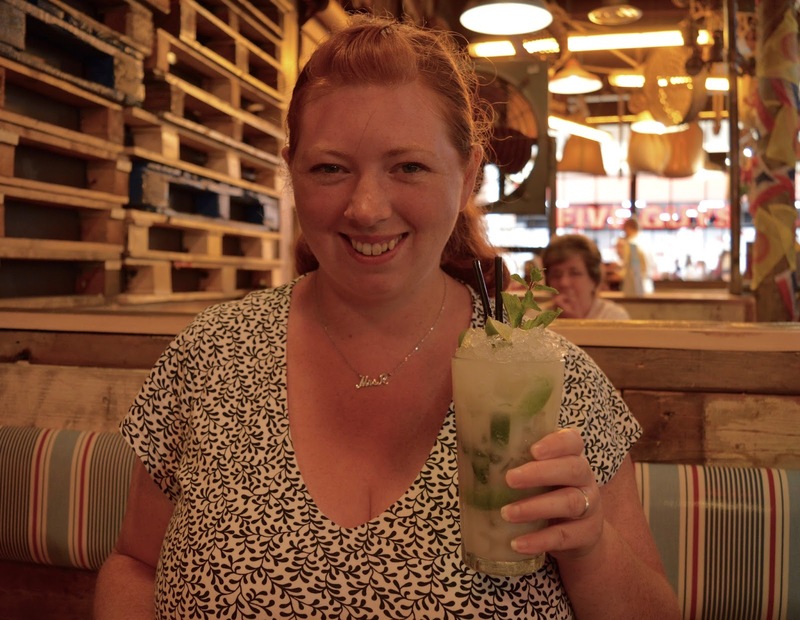 I ordered a Coconut Mojito which went down a treat and Steve went for a bottle of Singha beer (also good). The kids meals are priced at £5.95 for 3 (dubious) courses plus either milk, juice or water which is a good price I think. 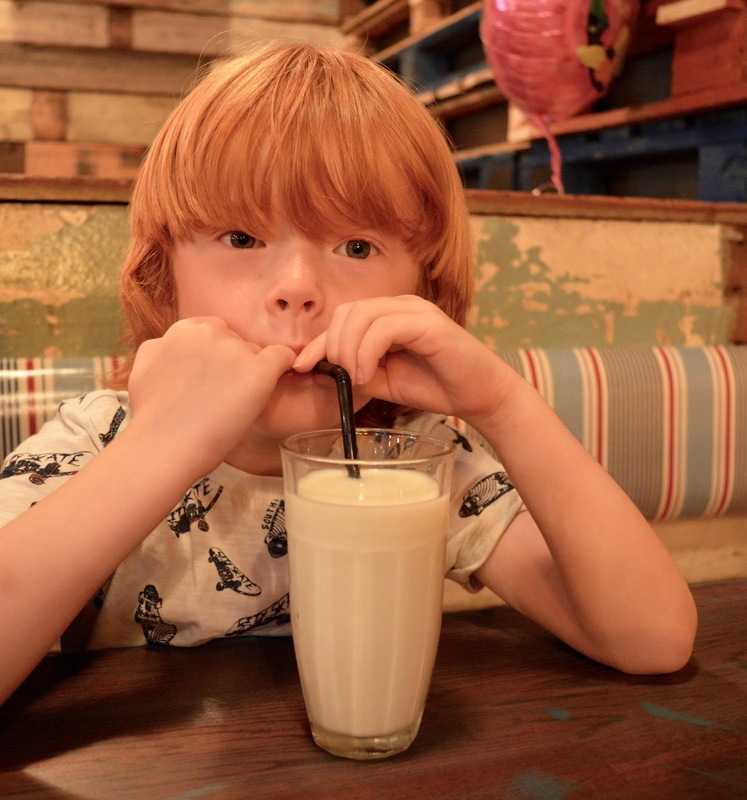 The kids ordered their milk and juice and we browsed the menu. 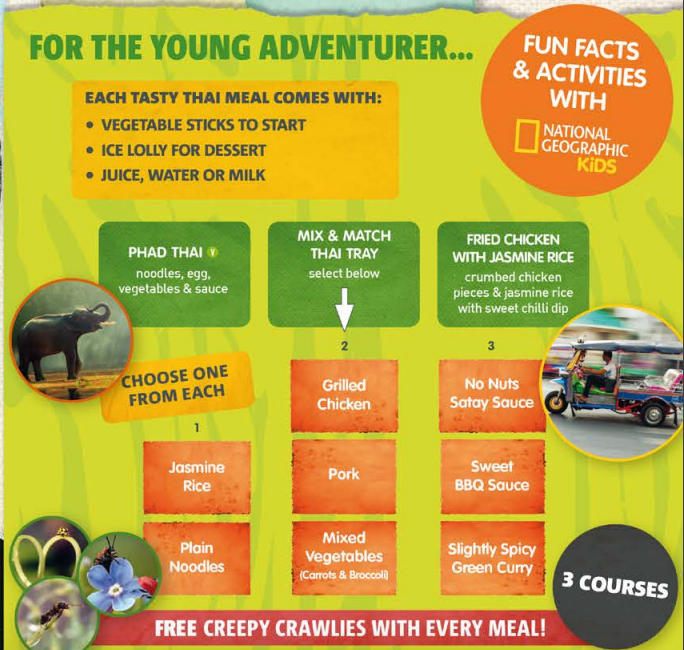 It had been all over social media and I had read in other reviews that kids get FREE creepy crawlies with every meal. Harry and I had been building up to this all day and we had decided we were going to film a live stream of us eating the bugs on our Facebook page. Unfortunately (or fortunately) for us the bugs never appeared and Harry was left disappointed.........(me not so much). 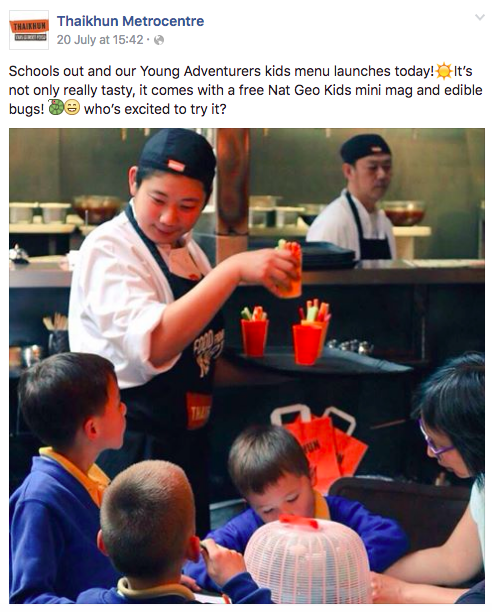 It is also clearly states on both social media and the menu that kids will receive a free National Geographic Magazine filled with fun activities and facts which I know my children would have thoroughly enjoyed and it would have kept them entertained during the 50 minute wait we had for our food. Unfortunately, these magazines didn't materialise either which is a shame. We were expecting lots of child friendly activites so hadn't come prepared and our children ended up bored and resorted to fighting under the table. Nice! 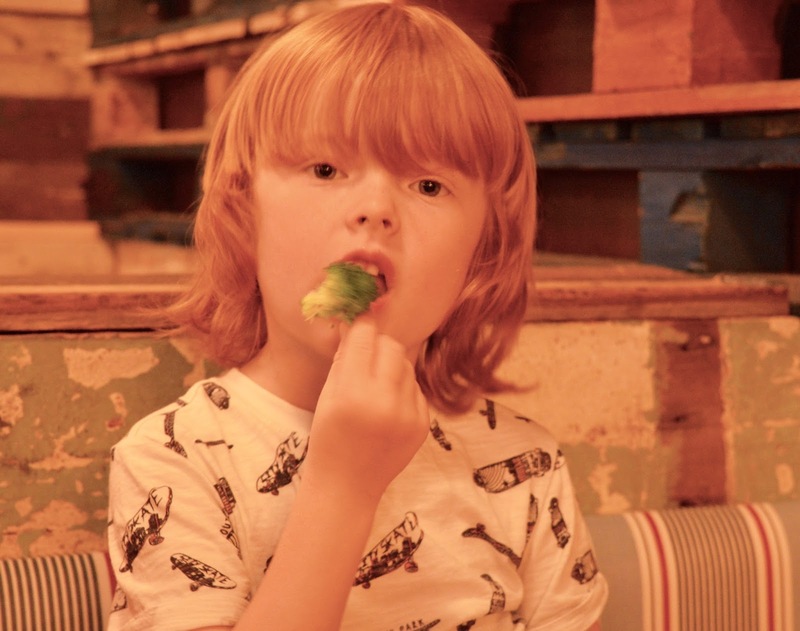 I find it very strange that we were invited to review the children's menu yet two major parts of the experience were left out. Who knows where things went wrong? 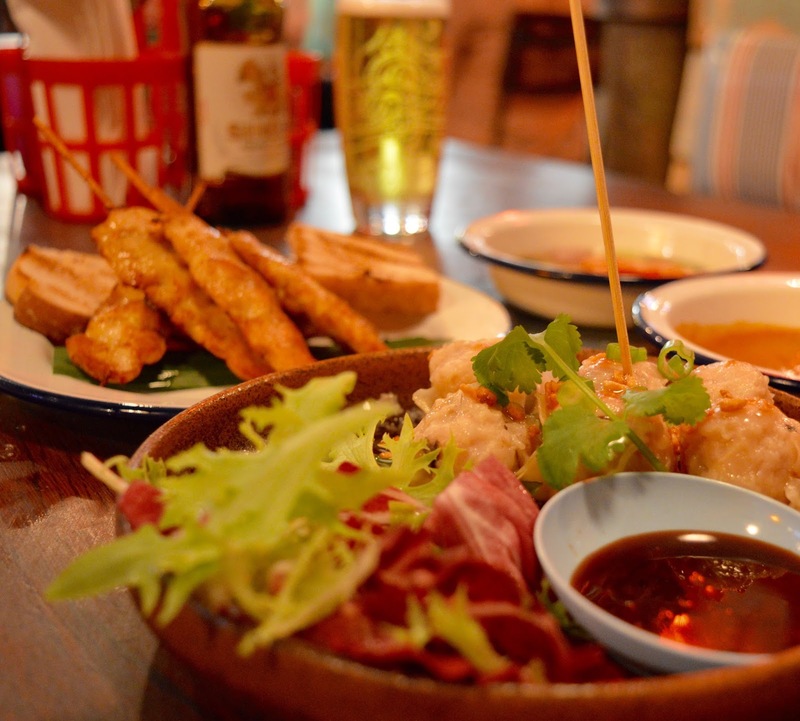 When our starters did eventually arrive they were 100% worth the wait. I went for the Ka Nom Jeeb which are steamed prawn and pork dumplings. They were absolutely divine and I would seriously recommend you give them a go. Steve ordered the Satay chicken skewers which again were the best we've eaten. I don't think there was a single drop of satay sauce left as we all tried to get the very last of it. So we ended up sharing our starters with the kids instead. Grrrrr for us but yeah for them! They also loved the chicken skewers. 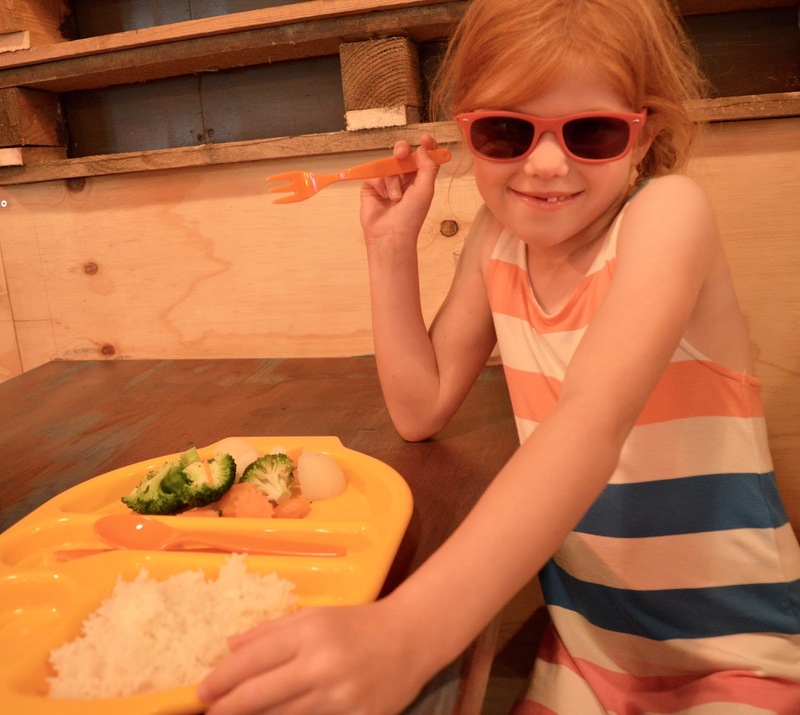 Onto our main courses and the kids can choose either rice or noodles, then chicken, pork or vegetables plus a side sauce. There are a lot of aspects I really liked about their meal - I LOVED that there were lots of veg included, the kids enjoyed the trays the meals were served on as it reminded them of their school dinners (it's nice that is was familiar to them when they were in unfamiliar surroundings), there is child-sized cutlery and sauce on the side gets the huge thumbs up from us as it's perfect for fussy eaters or for tempting your kids to try something new by just 'dipping' part of their food in their sauce to try it. The kids mostly enjoyed their meals and wolfed it down. 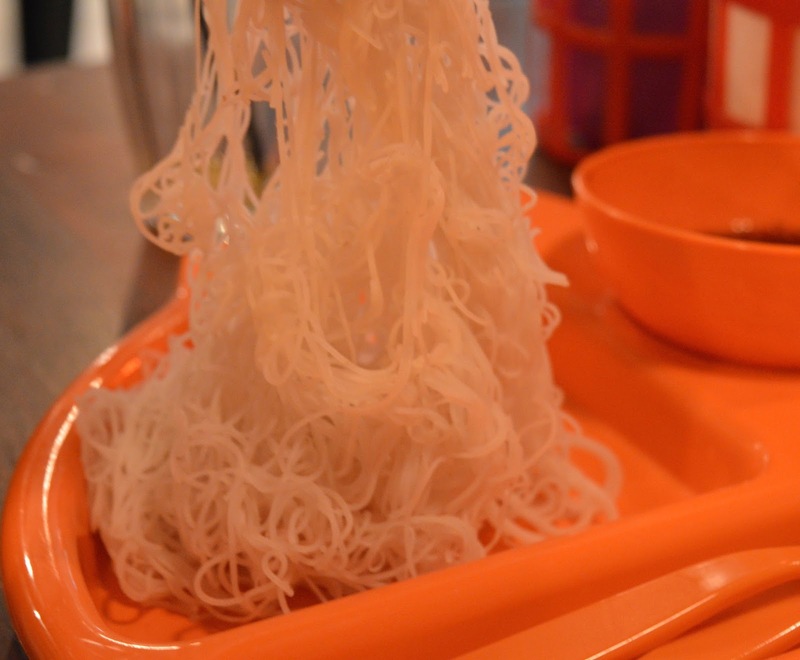 Harry wasn't so keen on his noodles and I have to agree - they went cold very quickly and ended up as one congealed mess - he said he didn't expect them to be so plain. The rice however was fab so if you'd like my advice it would be make sure your kids order rice rather than noodles. 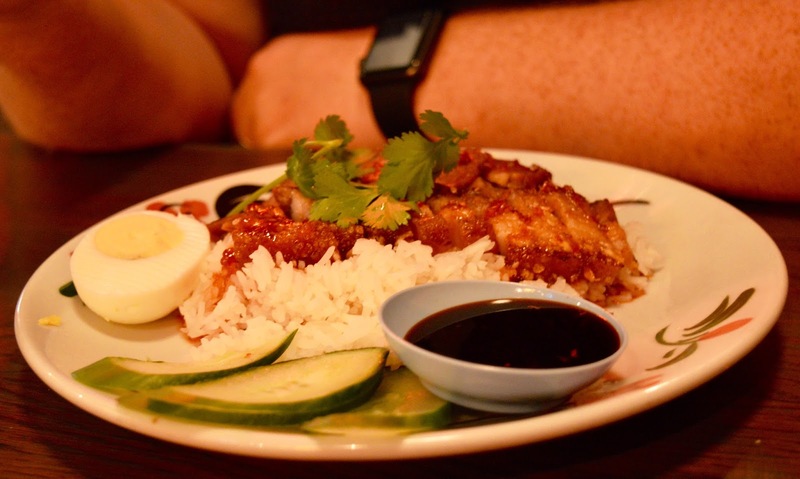 Both mine and Steve's mains were very impressive - Steve went for barbequed pork on rice which was nice and succulent and served with a chicken broth on the side. All fabulous and something we would order again. 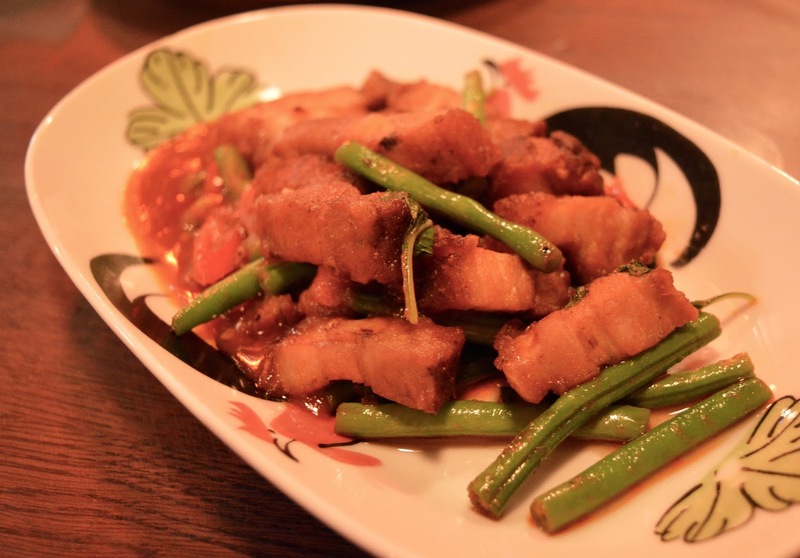 I went for the stir fried belly pork in red curry sauce which tasted lovely and authentic and had that kind of spice that just warms you up without making you gasp for water which I think is a pretty hard balance to achieve. As it was a stir fry I expected my dish to automatically come with noodles. It didn't and I should have read the menu properly as my meal seemed teeny in comparison to Steve's. I also think the staff should have picked up on this when I ordered & asked if I wanted any rice or noodles on the side. They didn't. Despite the lack of carbs, my meal was still lovely (and luckily I managed to steal some of Heidi's rice). 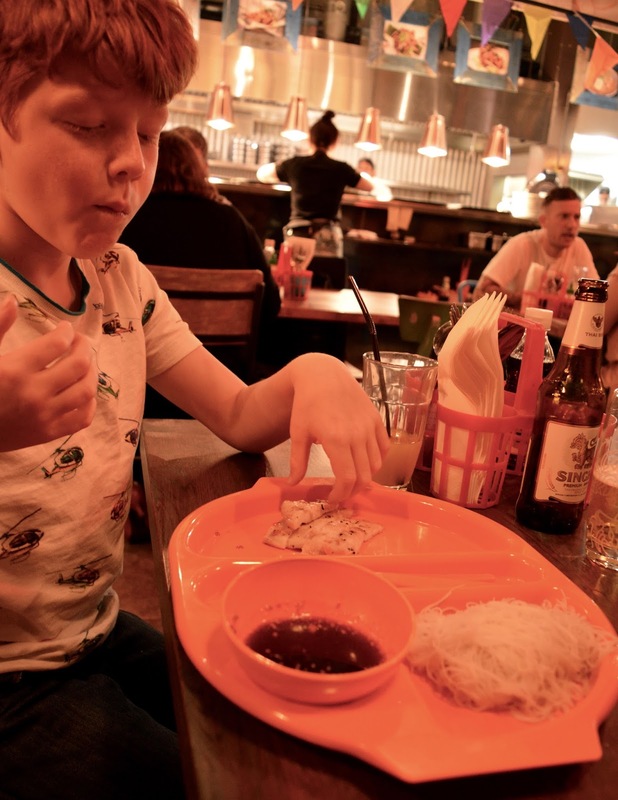 So, Thaikhun was a bit of a mixed bag for us. Our food really stood out as being delicious, fresh and packed full of flavour. It is of a high standard and I would certainly return with Steve when we are next in the Metrocentre. In terms of being child friendly though, I think they have a nice concept but need to actually deliver this to their customers. They definitely need to pull their socks up and offer all the child-friendly extras to EVERY customer if they are going to stand out as they have a lot of competition on their doorstep. 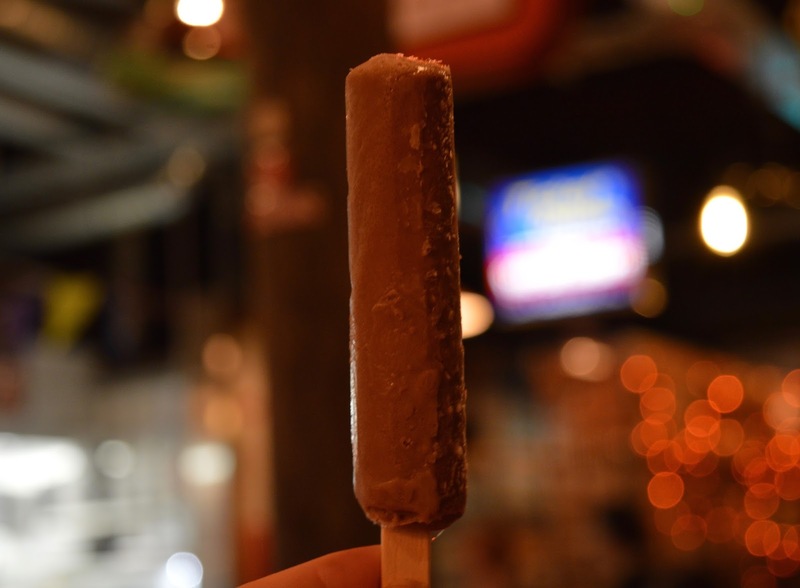 Let me know if you've been to Thaikhun and how you found your experience. 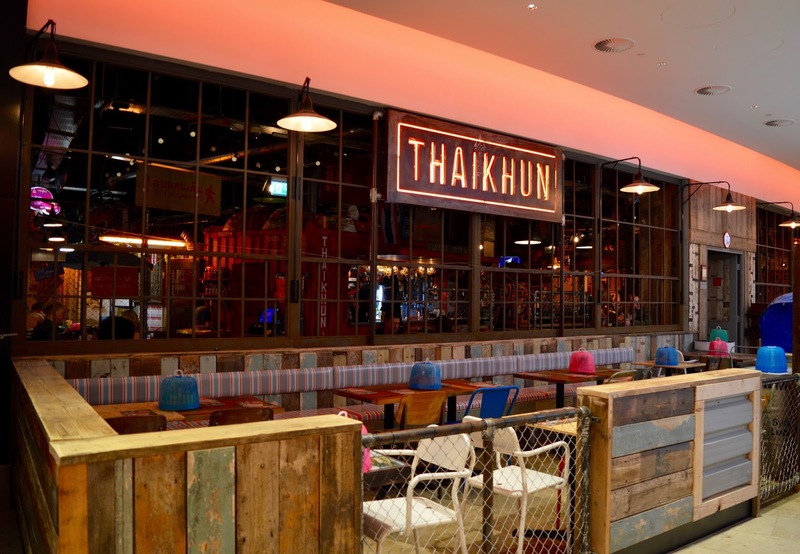 NEW EDIT: Thaikhun have been in touch and apologised for our experience. They have accepted it isn't acceptable and are going to take out points on board which I think is a breath of fresh air. They are going to send the kids some National Geographic magazines out too which is a nice gesture. Hopefully my experience has just been a one off. 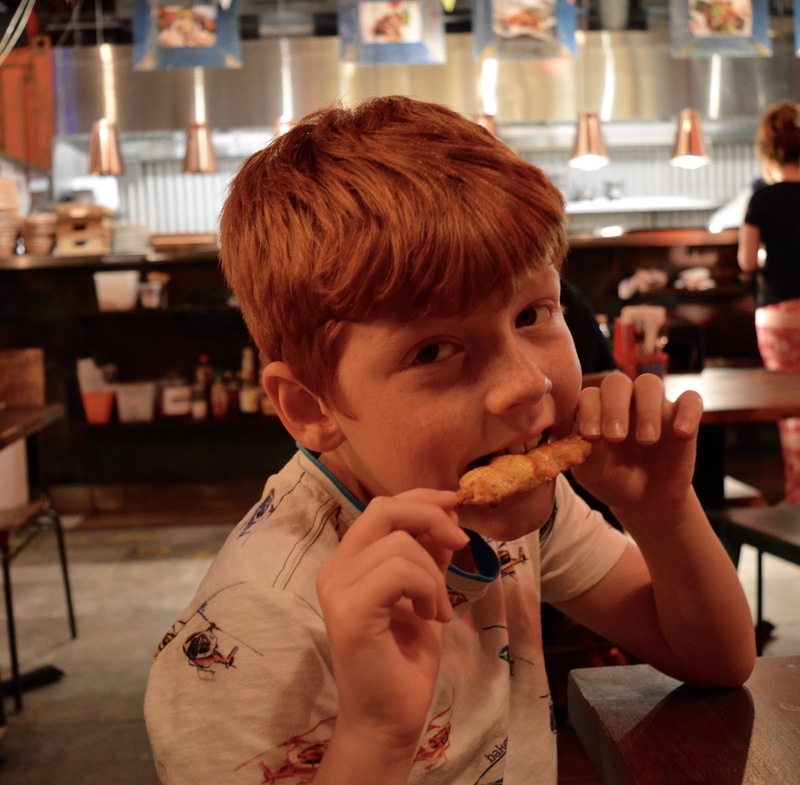 Disclosure: We received a complimentary family meal in return for an honest review. hmmm, not good about the tiny portion for the starter between 3, we didn't get a Nat Geo mag either, looby did get a sheet to colour in with crayons and games on though so maybe it was just that. I also can't believe you didn't get the bugs, maybe they've thought better of that though considering just how disgusting they are? How strange that they didn't ask if you wanted a side?! Love the giant kids plates but it's a shame the food wasn't as good as it could have been. What a shame about the bugs & magazine, not a great start especially when it's been advertised. The sharers for 3, not great at all. Honest review, good there's a lot of veg on offer, hopefully they'll take into consideration what they advertised and what they give. It's a shame it was a hit and miss for u guys. The food looks good but its a shame the place wasn't that child friendly for you. 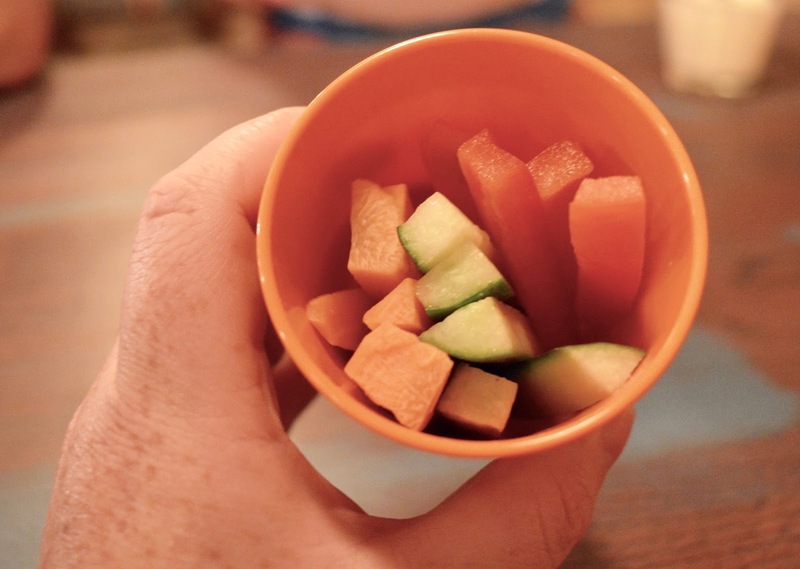 The sharing starter for the kids isn't great for between 3 kids. I've heard great things about Thaikhun. I'm really picky about customer service, and not sure if I'd go back after that. At least by giving them an honest review, you're giving them a chance to better service going forward. A bit of a hit and miss place then! It's a shame because it looks great there and the food looks so nice. 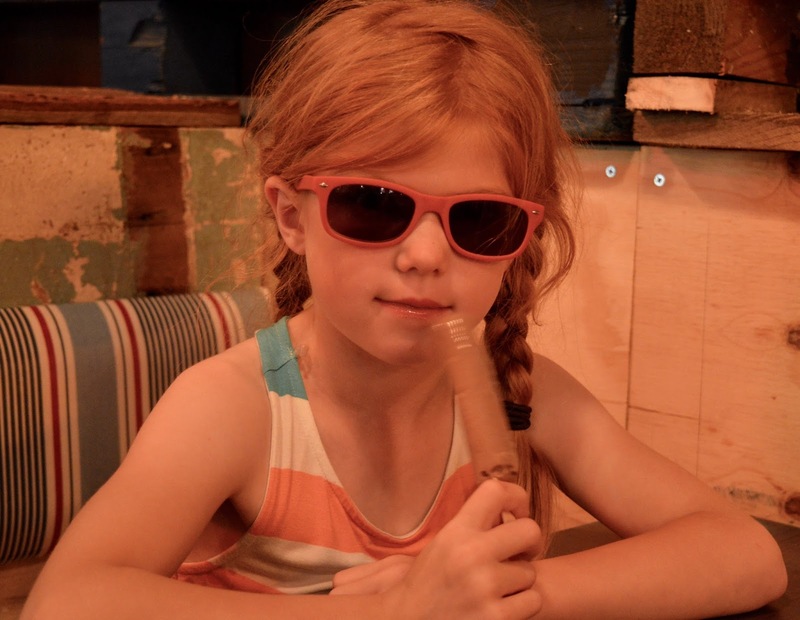 Thank you for coming into review us with your children and sharing your review with us. We are really sorry that we've not delivered to the level we'd have hoped on this visit. We are working to resolve each of these issues. You absolutely should have had the bugs and one vegetable sticks each. Unfortunately we've had a delay on the activity sheets from Nat Geo Kids, which will be with us by this weekend. We are super excited to have been able to work with the editor to custom design them, so it took a little longer than we expected. We've organised for you to be sent a copy of the magazine and our activity sheet early next week, which we will happily offer to any of your readers here who have missed out too. We worked really hard on trying to create a proposition that works well for kids and families, so appreciate your feedback so we can get it right. 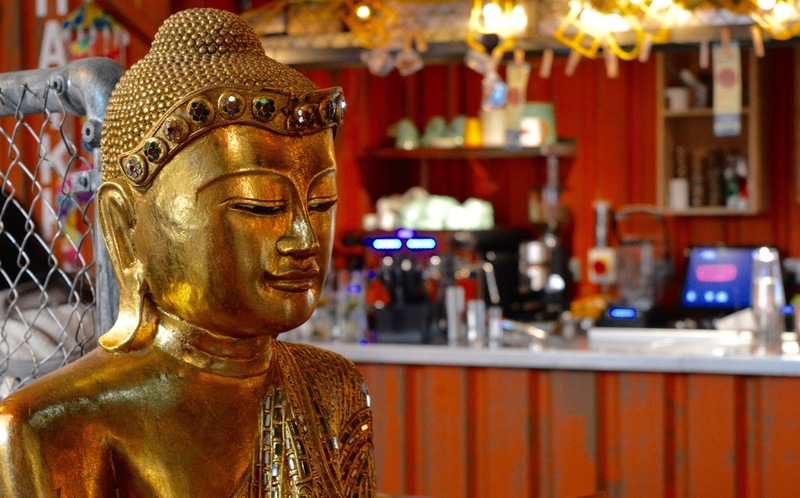 We have one of these in Manchester and it's like a little piece of Thailand until we can go back. Really balanced review and I've enjoyed reading it. I'm sorry you had a mixed experience but I'm pleased to read such an honest critique. I'll definitely be taking your recommendations on board for when we go!